Hot rod 4×2 intakes come in many forms, but most put the carbs in line behind each other or staggered in a 2-plus-2 arrangement. 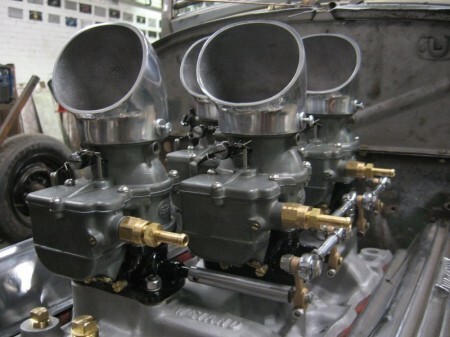 Some are widely spaced to get the carburetors right over the intake ports, with a big plenum chamber, like the famous Horne/Cragar early Cadillac intake (shown below), but some have a very close, overlapped stagger like the Weiand WC4D manifold which is more of a dual-plane design. Stromberg offers a choice of 4×2 direct (non-progressive) linkages – both inline and 2+2 kits, with a ready-to-fit kit for the Offenhauser Pacesetter 5024 intake and a ‘Trim-to-Fit’ kit for everything else. 4×2 in line. Pretty much all the early Flathead Ford intakes, plus a few early ohv intakes, put all four carbs in a line, like a typical 3×2, but with one more 97 squeezed on the end. The main brands you see around are Sharp and Weiand. Building a 4×2 direct linkage so all the carburetors work at the same time is simple. Just order up 4 of our 9091K kits (Superlink lever arm and swivel) and link them together with a straight length of 3/16th rod. You might want to order some of our 9054K Snapback torsion type carburetor return springs, too, but that’s pretty much it. Building a 4×2 progressive linkage is quite another thing. We have built some to special order, though, and here’s a picture to show how. Email us at sales@stromberg-97.com if you need one. Just one issue. As with most progressive systems, you can’t use banjo fuel fittings as they interfere with the long center levers. 4×2 staggered systems. If your intake manifold spaces the carburetors far enough apart across the intake to get separate linkage rods to each bank of carburetors, you need a quality, sturdy linkage that won’t flex when you stick your foot in it, and won’t swamp your beautiful 97s with huge ugly pillow-block brackets either. The Stromberg 4×2 kits, designed and manufactured exclusively by us, fulfil all those criteria with a whole new level of quality, efficiency and looks. 4×2 staggered systems need a direct (non-progressive) linkage, otherwise some intake ports (and therefore cylinders) are going to starve at low revs. Stromberg offers one type of 4×2 direct linkage, in two sizes. Our 9271-D Linkage Kit is ready made to fit the Offenhauser Pacesetter 5024 – Chevy intake, which spaces the carburetors 8-5/8 inch in front of each other and 6-1/2 inch apart across the intake with 3/4 inch offset (ie, the one bank is 3/4 inch in front of the other). This linkage is ready to go. It comes almost completely assembled with the Back-bar levers pinned to the shaft, and even though it bolts straight on, it still comes with full instructions, of course. If you have any other intake of this type, choose our 9270-D 4×2 Trim-to-Fit Direct Linkage Kit. 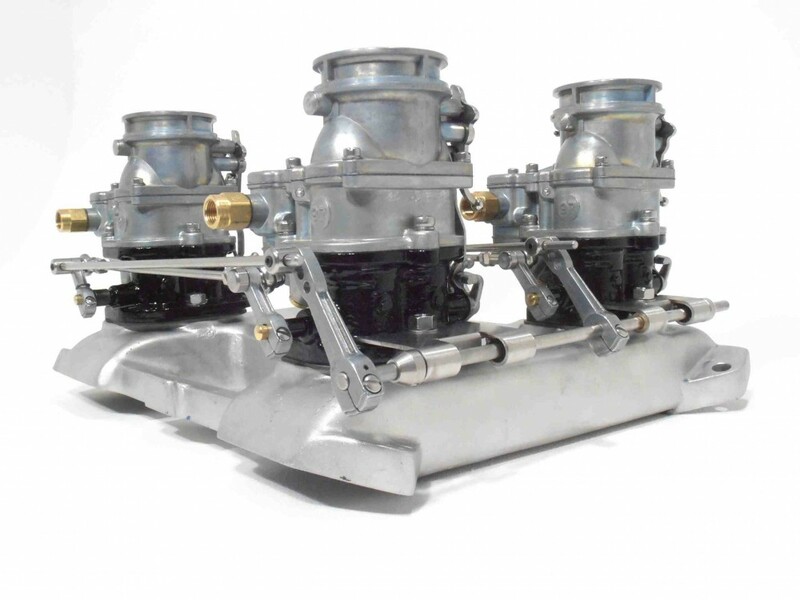 It will work with intakes that space the carburetors up to 9-1/2 inch in front of each other, and the same dimension across the intake, with up to 1 inch of offset between the two banks of carbs. Believe us, that’s going to cover pretty much every production engine around. How difficult is the trimming? You’ll be drilling one hole and maybe shortening one bracket and adjusting the lengths of the rods. Everything is explained in the Installation Guide included. Download a copy right here in our Tech Center if you’d like to see it first. The Weiand WC4D manifold. We mentioned the Weiand WC4D manifold, above, which sets the Stromberg 97 carburetors in a sort of in-line, overlapped stagger. It places the carburetors so close together, in fact, that our 4×2 kits do not work with this intake. You need long throttle shaft extensions, which can flex and twist in operation. However, we have seen cool linkages with extra beefy shaft extensions specially built for this intake built by Stromberg dealer Baxter Ford in Lawrence, Kansas. Click on the pics below to see more. So if you need one, you’ll find Baxter Ford’s details on our Dealer Network page. Your link to the pedal. Stromberg recommends a mechanical pedal link for all multi-carb systems. Ideally, your 4×2 Back-bar can be connected to the pedal via one of the long levers that work the two banks of carburetors (they have three adjustment/connecting holes at the top). 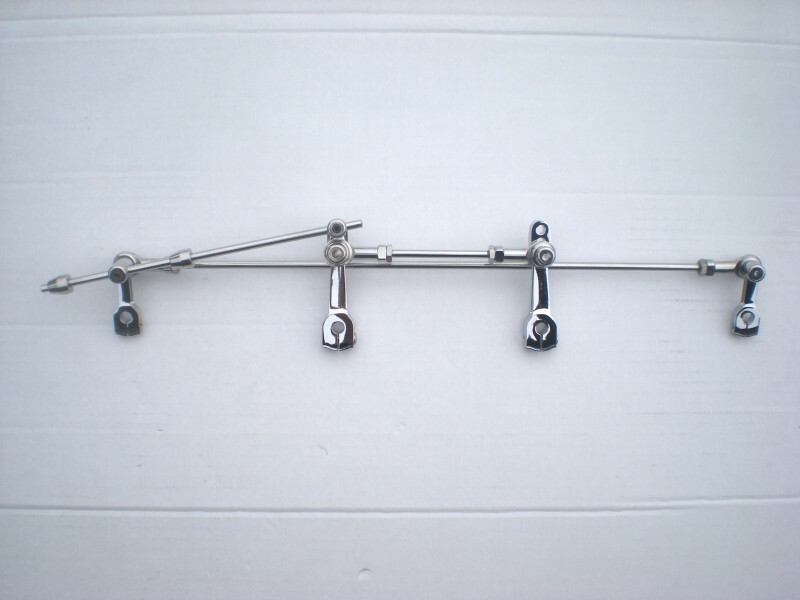 However, if these do not line up with your pedal link, you can add a third long lever to the Back-bar shaft with Stromberg kit 9096K (Long linkage arm/swivel) positioned to align with your throttle pedal ‘pull’ point. Complete with swivel, clamping screw and 3/32” roll pin, the 9096K lever can also be drilled and pinned to the Back-bar to ensure positive location. You can download this Tech article at the Stromberg Tech Center (click the link). As with all our Tech articles, we welcome customer feedback and other input. Email us ( tech@stromberg-97.com ) with your thoughts and if it adds to the debate, we can add it in. 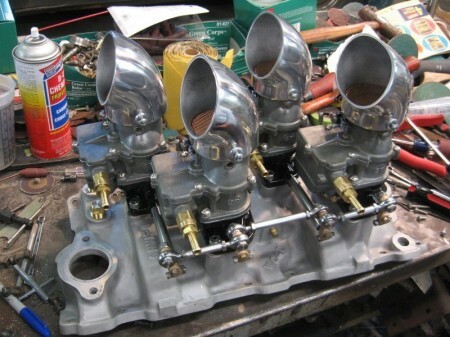 This entry was posted in Tech articles and tagged 4x2, 97, hot rod, linkage, Offenhauser, TwoStep by Clive. Bookmark the permalink. Hi Sabin, I think you are right. The 94 idle needle jets are on the back of the carb right where that Back-bar bracket needs to go. I will check it physically tomorrow and confirm but it’s not looking promising. Sorry, Clive. Hi, I am sorry but we have no contact information for Jim Phillips.